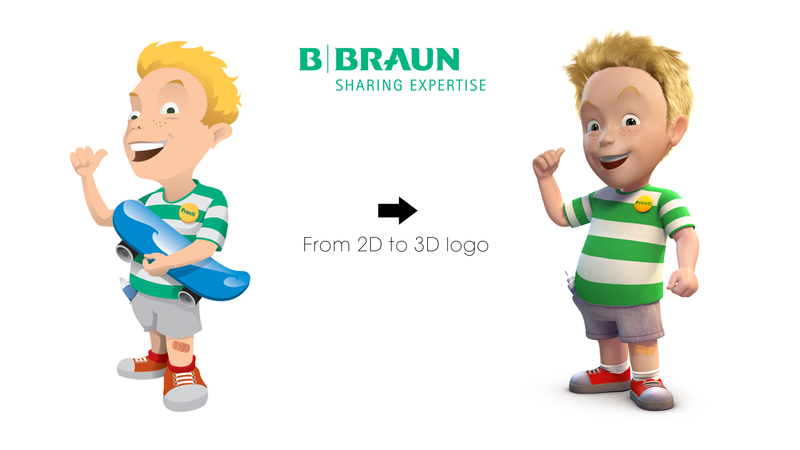 Transforming an existing 2D logo or mascot into a 3D cartoon character is a service you can buy from any 3D cartoon animation studio or 3D cartoon freelancer. Giving real shape and dimension to a character really brings it to life and makes it much more convincing and believable, especially when it comes to delivering messages to the audience. It might seem obvious that since the 2D design of a character already exists, making it in 3D must be a somewhat automated process accomplished with nowadays sophisticated 3D software and that not much work or experience is required on the designer’s part. But reality is different. Imagine a dozen painters making an oil painting of the Eiffel tower. What happens is that you will see as many different results as there are painters, and exactly the same goes with 3D. This is because a very important factor comes into play which has a huge impact on the end result, and is exactly what distinguishes the level of capability of an artist – interpretation. Because 2D and 3D are in two different dimensions they can impossibly look identical. At the same time this doesn’t give the designer free run to improvise and distort the look of the character to his taste. 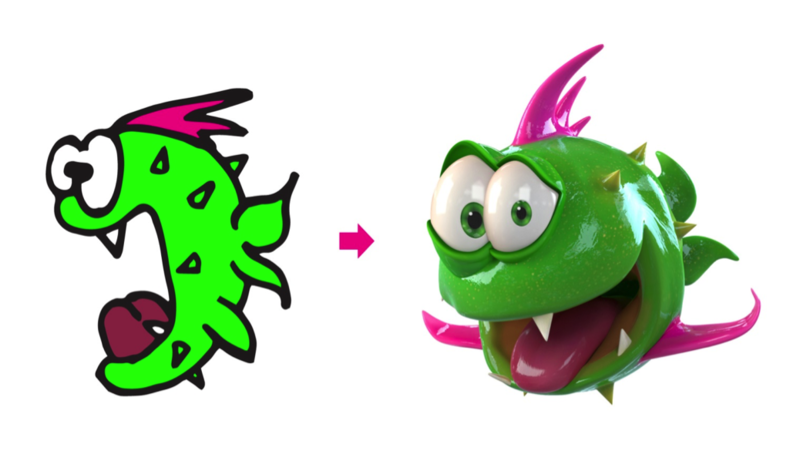 Companies are usually very strict about wanting to preserve the appearance of their mascots as much as possible – it is vital for them that after years of using them they can’t suddenly change them to a new look that no one would recognize. Below we see a typical example of what it means to interpret a 2D logo, how many spikes does a fish have? It is obvious that when drawing 2D characters the artist doesn’t think in terms of numbers, but of what looks best according to each individual illustration. This inevitably creates mismatches and contradictions when a 3D artist tries to understand the real anatomy of the animal. Every other part is subject to questions as well: which eye is bigger? Which head fin is bigger? Are they disposed one after the other or one beside the other? When the character smiles, does the mouth go all the way up behind the eyes or does it stop at the beginning of the eye line? It is now the job of the 3D artist to find the best solutions to these dilemmas and come up with an ideal compromise. In the case of this fish character it was decided to give him 4 spikes, but slightly differently arranged, because it appeared unacceptably weird to have a spike in the proximity of the mouth, it looks too aggressive and goes against the sympathetic look of the character. Eyes are modelled with identical sizes and head fins are at three different sizes, arranged in a straight line. Do you have questions or need to hire a 3D artist to transform your logo into a 3D cartoon character? Contact us at info@visualcenter.ch and we’ll get in touch with you within the blink of an eye.